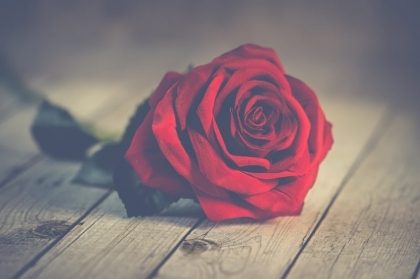 Blog - Why Are Valentine's Roses an Important Gift Tradition? Are you looking for a romantic gift for the special woman in your life? Discover why Valentine's Roses are an important romantic tradition. What do love, beauty, war, and politics, all have in common? Roses of course! Roses have a deep-rooted history filled with stories of tragedy, love, and desire. These famous flowers have been around for 35 million years, yet they continue to grow in popularity. 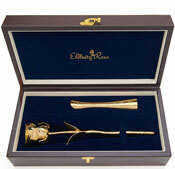 Are you thinking about giving Valentine's roses to your lady this year? Candy, teddy bears and cards are all fun gifts to express a simple kind of love. Yet, if your love is passionate and budding, then roses are the best way to go. Read on to learn about the colorful history behind this gift-giving tradition. Valentine's Day began during the third century in Rome. Emperor Claudius II, hungry for power, declared single men made better soldiers. To enforce his declaration he made it illegal for young men to marry. Valentine, a young priest, thought Claudius’ new law was unjust and immoral. Instead of obeying the Emperor’s ruling, Valentine continued to marry young couples. When Claudius found out about the secret weddings he was livid. Sentencing Valentine to death, the Emperor put him in jail. Rumor has it that while sitting in jail, awaiting his death sentence, Valentine fell in love. What began as a friendship with the jailor's daughter, soon became more. Over the months, Valentine and the jailor’s daughter formed an unbreakable bond. As the legend goes, their love was passionate, the kind you can’t live without once you’ve tasted it. The jailor’s daughter would have to learn to live without her one true love. On February 14th, 270 AD, the executioner carried out the beheading of Valentine. Gone forever, he left behind one last token of love, a letter. The love letter addressed to the jailor’s daughter, at the end of his letter he wrote, “from your Valentine”. "From your Valentine" is a phrase you'll still hear today. Valentine took a stand for young love and learned to love as well. His courage has been an inspiration for sending love notes, gifts and Valentine’s Day flowers. Since his death, Pope Gelasius chose February 14th as a time to honor Valentine’s memory. Before Valentine’s Day started, February was a popular time for fertility festivals. This is why flowers are the number one gift choice to celebrate love on this special day. During the Victorian era, people would send messages using flowers. Different flowers created opportunities to express romantic feelings that were often taboo. Floriography, the language of flowers, helps shed light on the messages you can send. Roses carry with them some of the strongest meanings and symbolism. During the War of the Roses, different colors stood for specific powers. They were also popular in Europe during the 1700s as a recreational flower. 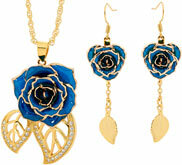 Romantic roses go all the way back to ancient times. The goddess of love, in Greek and Roman mythology, has close ties to the sturdy flower. Ceremonies about love, like marriages, would use red roses as decorations. Some of the meanings behind the red rose come from myths surrounding the Greek goddess of love. According to the myth, the goddess Aphrodite was in love with Adonis. One day when Adonis became hurt she ran to be by his side. In her haste, she pricked her foot on the thorn from a white rose. Aphrodite’s blood stained all the white roses in her path, turning them red. Red roses thus became a symbol of true love and devotion. What type of relationship are you in? Is this the first Valentine’s Day you’ll be spending with your loved one? The rose color you choose should reflect the level of your commitment. Here’s a brief guide on the different rose colors and their meanings. A red rose symbolizes passion, desire, and romantic love. If you’re in a long-term relationship, this is the right choice for you. 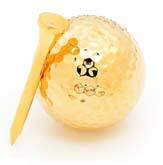 They are also a symbol of beauty that let your Valentine know you see how special she is. Send one rose and you’re telling your Valentine that you’ll always be loyal. Yet send a dozen red roses and you’ll be declaring, “I love you”. Are you thinking about finally tying the knot? While a white rose means innocence and purity, it also holds a romantic meaning. White roses symbolize that you’ve found your soul mate. They are the perfect choice when a marriage proposal is in your near future. Stay away from yellow roses on Valentine’s Day. These flowers may be sunny and bright but giving them means you only want to be friends. Of course, if you’re looking to get out of a relationship, yellow roses would be one way to deliver the message. Are you exploring a brand new relationship? Declaring your love with red roses might not be the right move if your relationship is fresh and new. Valentine’s roses do a great job of letting the woman in your life know how you feel. The only problem is, no matter what rose color you choose, they are only temporary. As time passes, the once beautiful reminder of your love fades away. This Valentine’s Day, give her a gift that will stand the test of time. 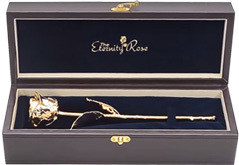 The Eternity Rose wants to help you bring joy to the woman you love. 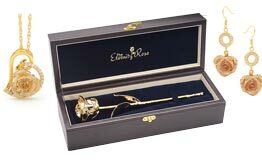 The exquisite gift sets combine the romance of roses with the elegance of jewelry. Are you ready to give a unique gift that honors the most recognizable token of love? The Eternity Rose red glazed rose and vase gift set is sure to get the reaction you’re looking for.